The never ending question: how to distract your toddler or preschooler when they are getting just a teeny bit whiny. One sure fire hit (pardon the pun): give them something to pound. I realize this is a terrible photo, but if you get a piece of Styrofoam in a package (Do not buy Styrofoam! — Gah!) it’s a great platform for pounding. Find some suitable objects — we used golf tees and these ridiculous plastic tabs that come in dress shirt collars (can you say “wasteful”?) — and pound away. 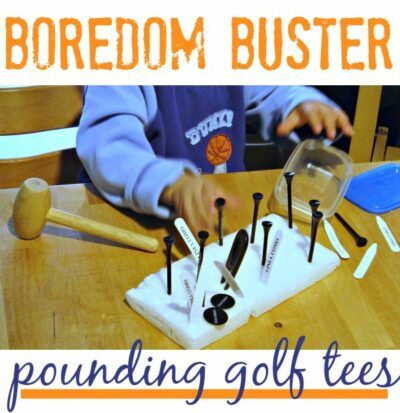 It’s a good activity to build hand-eye coordination as well as developing fine motor skills, but most of all, it’s just plain FUN. P.S. “Green” tip: If you ever receive a package packed with plastic “peanuts” you can return them to your local UPS store for reuse. Please do so! More more easy toddler distractions click on the image below. This has been on our “to-do” list for ages, but I have neither golf tees nor styrofoam… Or even shirt tabs! That's a cool idea with Christmas coming up and the potential for lots of left over packing plus we have handwriting issues due to weakness so I'm always looking for fine motor hand activities. Someone buys styrofoam? Gah indeed!